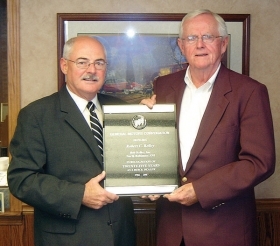 -- Dave Burke and Ray Burke of Burke Motor Group in Cape May Court House, N.J., received 25-year awards for Chevrolet from General Motors. Robert Kelley, right, of Bob Kelley Chevrolet-Buick in North Baltimore, Ohio, receives a 25-year award for Buick from Pat Stark, General Motors' central Ohio zone manager. 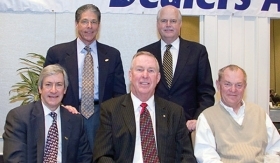 Members of the California New Car Dealers Association elected officers. Standing, from left, are Gary Shipman of Toyota-Scion of Santa Cruz in Capitola, chairman; and Peter Welch, the association's president. Sitting, from left, are Denny FitzPatrick of Fitzpatrick Chevrolet-Hummer in Concord, immediate past chairman; Steve Snyder of Gold Rush Chevrolet-Subaru in Auburn, secretary-treasurer; and Tom Hoffman of Puente Hills Chevrolet in City of Industry, vice chairman.